Package Leak Detection system using a water-based bubble test. 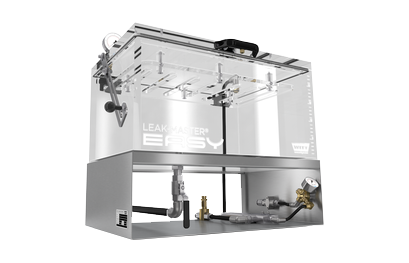 LEAK-MASTER® EASY allows the detection even of the smallest of leaks. After the package is placed into the chamber filled with water, the head space above the water level is evacuated using a venturi vacuum (compressed-air) system. This causes the package immersed in the water to inflate, allowing any leaks and their location to be identified by a stream of bubbles. Micro-leak detection system for packages based on CO2. LEAK-MASTER® PRO features non-destructive detection of the smallest of leaks, without the costly use of helium as a trace gas.